For years I've collected vintage patterns. I think around 1/2 my pattern stash is vintage. 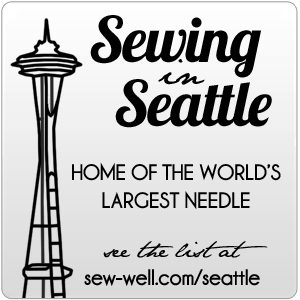 I've made aprons, dresses, shirts to wear with suits and plenty more. In fact, most vintage patterns have more ease built into them in the smaller sizes than plus sizes do. Maybe it's that my body type better suits the styles then, or maybe it's how they drafted patterns. Here's a quick example of a couple dresses I've made in years past. Below is a photo from 2007 with my friend Shannon & I both wearing dresses that I made each of us. My dress is a composition of the top of one 1950's pattern with the bottom of another. I LOVED that dress. Shocking purple dupioni silk. I was hot! Jewelry: designed and created by Me. The Necklace beads are turquoise shot with color. The earrings are colored wood with bits of old LP's. Fabric: Alexander Henry Skulls (cotton quilting) with Red Bias Trim. 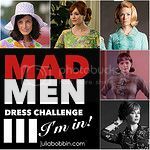 Imagine my delight when I discovered Julia Bobbin's 3rd Mad Men Dress challenge. Participating enables me to pair my love of vintage patterns with my desire to sew several summer dresses using up stash fabric. Yippie! Now to do some stash diving. Deadline is April 1st. Don't be fooled, this will be loads of fun! Here are a few links to dresses that inspire me from Mad Men. I have to admit, I haven't gotten caught up in the Mad Men show. I'm more a Doris Day / George Gently fan. Have you watched any of Doris' movies like "Glass Bottom Boat" or have you discovered the tough social subjects the Inspector George Gently shows tackle?